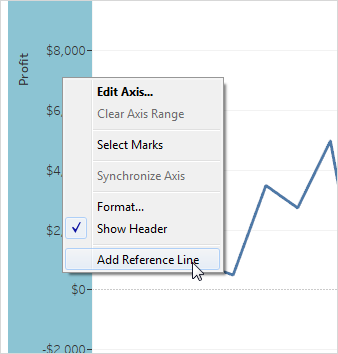 Right-click on a quantitative axis and select Add Reference Line, Band, or Box. In the Add Reference Line, Band, or Box dialog box, select Distribution. Confidence Interval - shades the interval between which lie the specified percentage of values. Percentages - shades the interval between which lie specified percentages of values. Separate multiple percentage values with a comma (for example, 60, 80). Percentiles - shades intervals at the specified percentiles. When you select this option, you must also specify one or more numerical values. You will not actually see any shading unless you specify at least two values (for example, 60,80). Quantiles - breaks the view into the specified number of tiles using shading and lines. When you select this computation, you must also specify the number of tiles (from 3 to 10, inclusive). For example, if you select 3, Tableau calculates the boundaries between the first, second and third terciles by calling the general quantile function and asking for the 33.33 and the 66.66 quantiles. It then shades the three terciles differently. Tableau uses estimation type 7 in the R standard to compute quantiles and percentiles. For further details, see Quantile (external link to wikipedia page, in English). Standard Deviation - places lines and shading to indicated the specified number of standard deviations above and below the mean. When you select this option you must specify the factor, which is the number of standard deviations and whether the computation is on a sample or the population. Specify formatting options. You can format the lines (for example, style, thickness, and color) as well as the fill gradient. Select from a list of predefined gradients. Select Reverse to change the order of shading in the gradient and Symmetric to use a single color instead of a gradient. You can also specify whether to add additional shading above and below the defined distribution.